We cannot hope to build a better world without improving the individuals. To that end each of us must work for his own improvement, and at the same time share a general responsibility for all humanity, our particular duty being to aid those to whom we think we can be most useful. We must have perseverance and above all confidence in ourselves. We must believe that we are gifted for something. It was my good fortune to be linked with Mme. Curie through twenty years of sublime and unclouded friendship. I came to admire her human grandeur to an ever growing degree. Her strength, her purity of will, her austerity toward herself, her objectivity, her incorruptible judgement- all these were of a kind seldom found joined in a single individual... The greatest scientific deed of her life— proving the existence of radioactive elements and isolating them— owes its accomplishment not merely to bold intuition but to a devotion and tenacity in execution under the most extreme hardships imaginable, such as the history of experimental science has not often witnessed. 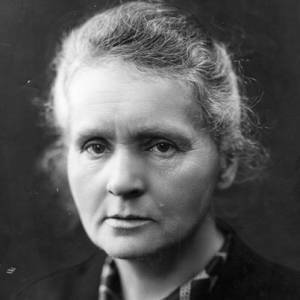 Marie Curie is, of all celebrated beings, the only one whom fame has not corrupted. Pierre Curie, a brilliant scientist, happened to marry a still more brilliant one- Marie, the famous Madame Curie- and is the only great scientist in history who is consistently identified as the husband of someone else.